Every once in a while a song comes up on my iPod that makes me reach for it to see who it is. And for the past couple of weeks, I would say 7 times out of 10 it is a song from the upcoming Albert Hammond, Jr LP, ¿Cómo Te Llama?. Sorry Miami, Bro (love you), but I don't think the Strokes music is "musical diarrhea". I go with the mindset there is a time and place for (most) music. And sometimes you want want fun music. You don't want to think about it, you just want the music to be good. I know The Strokes have a tainted past in some indie mindsets because of their "priviledged" upbringing, and perhaps their luck at getting signed was not so much about talent or luck. I don't really by it, but either way I was entertained by the music and ultimately that is what I want from it. I would say Hammond's latest release is a far more polished (less garage) sounding album than any of The Strokes album leaning more towards Spoon than, well, The Stokes. Oh so funny Albert Hammond story, when The Strokes first played Miami at Billboard Live (that promising live music venue that fizzled and now is Dolce - yes that Dolce of Dolce Gabana) my friends and I waited outside for the band to come out. Between one friend standing in the street to prevent the bus from moving so she could see Julian Casablancas and my other friend getting a kiss from another band member, my girlfriend at the time got my shirt signed by Hammond. 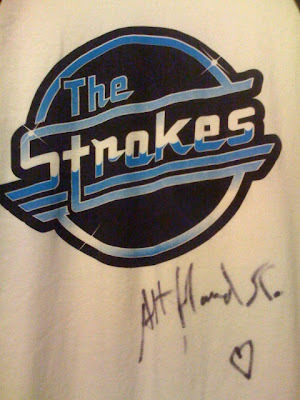 Except he though he was signing it for her so now my Strokes shirt shows how much he "hearts" me. Oh and Julian finally did come out and blow my friend a kiss right before the bus almost ran her over. And from his previous release, Yours To Keep .. This is why you guys are so popular in hype machine! Surprised you didn't mention GfC. I heard GfC last week for the firts time and loved it. I think his first album "Yours to Keep", did not get enough love, but sometimes that's a good thing. I totally agree on the whole 2nd paragraph! No pic of the signed shirt?! Great story!!!! "Ashton Kutcher, Wilmer Valderrama, Chris and Danny Masterson, Laura Prepon, Dule Hill and Jamie Kennedy, all of whom are investors in the Dolce Group"
Yeah Gfc is another great track and I think the first single. ok, so i just noticed the shirt! even though you did not mention it, i felt the unwritten comment... "vik, it's like in front of you man, are you f*ckin blind!!!??"